"Dao is the way of human life when it flows in harmony with the way of nature." "Water is used as a representation of Dao because water always seeks the path of least resistance. It does not compete; it simply spiders out, finds the easiest path and follows it, yet there is nothing stronger. Water will carve through rocks, run around steel or anything which resists it. And it does so by simply rising or using gravity." "The human body does not come with an instruction and maintenance manual. If we want to achieve as long and healthy a life as possible, we need guidance on basic lifestyle factors such as diet, rest, sleep, exercise and so on, This article discusses two sources of such guidance: traditional Chinese health preservation teachings and modern lifestyle research." 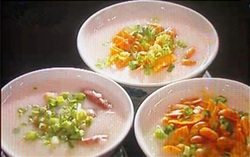 In Traditional Chinese medicine (TCM), there is an old saying:" Traditonal medicine and food share the same origin." many common foods serve as medicines such as ginger, cinnamon, shallot, garlic, Chinese date, vinegar, sesame to name a few. Like Chinese herbs foods also have different natures and flavours accounting for their actions of reinforcing or reducing, and ascending or descending. Diet should be allocated in accordance with nature and function of food as well as individual body constitution in order to maintain good health, prevent disease and prolong life. Clinck here to view the whole PDF on Health Preservation by Foods in Chinese Medicine. Taught by a Buddhist teacher, the meditation techniques are not religiously affiliated. They are simple and workable for anyone interested in developing mindfulness and improving inner well-being.